Permeable paving allows stormwater to drain through the surface and into a stone reservoir, where it infiltrates into the underlying native soil or is temporarily detained. 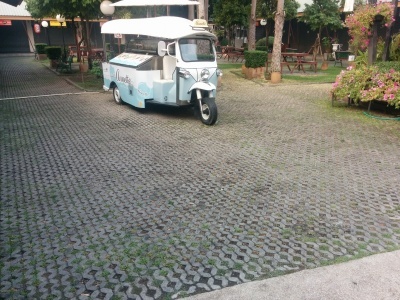 Permeable paving can be used for entire parking lot areas or driveways and can be designed to receive runoff from adjacent impervious surfaces. 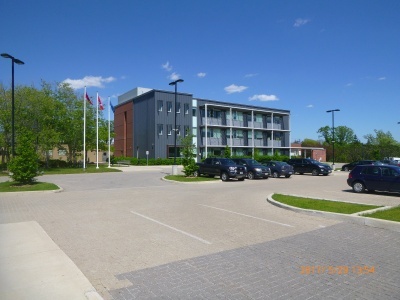 For example, the parking spaces in a parking lot may be permeable pavers while the drive lanes themselves are impervious asphalt. In general, the impervious area should not exceed the area of the permeable paving which receives the runoff. 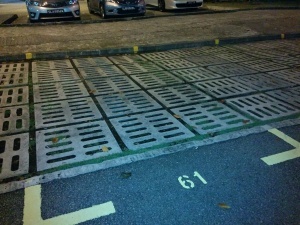 A hybrid permeable paving/infiltration chamber design can feature connection of a roof downspout directly to the stone reservoir of the permeable paving system, which is sized to store runoff from both the pavement surface and the roof drainage area. In most designs, the surface acts as pretreatment to the stone reservoir below. Periodic vacuum sweeping and preventative measures like not storing snow or other materials on the pavement are critical to prevent clogging. Another pretreatment element is to have a choking layer above the coarse gravel storage reservoir. Landscaped areas must drain away from permeable paving to prevent sediments from running onto the surface. Urban trees will benefit from being surrounded by permeable paving rather than impervious cover, because their roots receive more air and water. 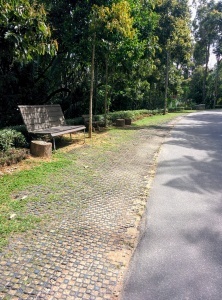 Interlocking pavers used around the base of a tree may be removed as the tree grows. Prioritize infiltration of runoff from source areas that are comparatively less contaminated such as roofs and low traffic areas. 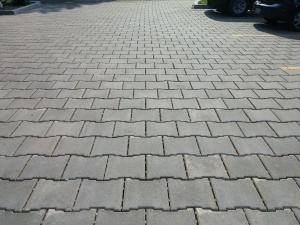 Permeable paving is not typically used in locations subject to heavy loads. However, some permeable pavers are designed for heavy loads and have been used in commercial port loading and storage areas. 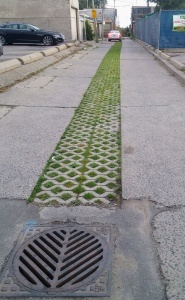 Permeable paving should be located downslope from building foundations. If the paving does not receive runoff from other surfaces, no setback is required from building foundations. Otherwise, a minimum setback of 4 m down-gradient from building foundations is recommended. 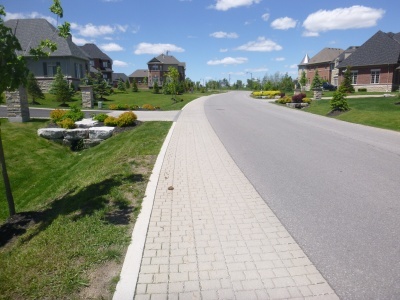 If permeable paving systems are installed on private lots, property owners or managers will need education on their routine maintenance needs, understanding the long-term maintenance plan. They may also be subject to a legally binding maintenance agreement. An incentive program, such as a storm sewer user fee based on the area of impervious cover on a property that is directly connected to a storm sewer, could be used to encourage property owners or managers to maintain existing practices. Consult the manufacturer for the design specifications of their product. In pervious concrete and porous asphalt systems, the concrete or asphalt mix specifications and construction procedures are key to proper functioning. These systems require well-trained and experienced contractors for installation. ASTM No. 8(5 mm dia) crushed aggregate is recommended for fill material in the paver openings. 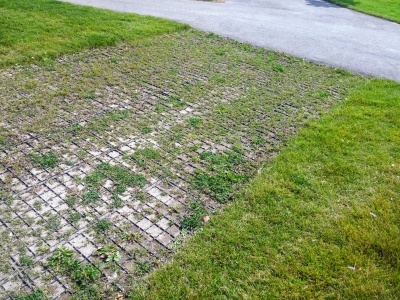 Most OPSS aggregates are not recommended for use in permeable paving systems. The exception being type 'o' with a default void ratio of 0.3. Geotextiles are not always necessary and may be prone to clogging. Consider using courses of finer aggregates or sand instead. The stone reservoir must meet both runoff storage and structural support requirements. The bottom of the reservoir should be level so that water infiltrates evenly. If the system is not designed for infiltration, the bottom should slope at 1 - 5% toward the underdrain. Landscaped areas must be graded drain away from permeable paving to prevent sediment from running onto the surface. Urban trees benefit from being surrounded by permeable pavement rather than impervious cover, because their roots receive more air and water. Block pavers around the base of a tree can be removed as the tree grows. As with all stormwater infiltration practices, risk of groundwater contamination from infiltration of runoff laden with road de-icing salt constituents (typically sodium and chloride) is a significant concern. Chloride ions are extremely mobile in the soil and are readily transported by percolating water to aquifers. Sediment Control: The treatment area should be fully protected during construction so that no sediment reaches the permeable pavement system and proper erosion and sediment controls must be maintained on site. Weather: Porous asphalt and pervious concrete will not properly pour and set in extremely high or low temperatures . 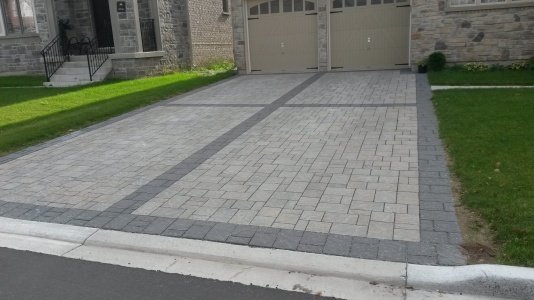 One benefit to using permeable pavers is that their installation is not weather dependent. Pavement placement: Properly installed permeable pavement requires trained and experienced producers and construction contractors.